Available for download in PDF as well as in every digital e-reader format under the sun! Are you a parent writer who has always wanted to learn the ins and outs of writing for regional parenting publications? If so, look no further, Write For Regional Parenting Publications For Fun & Profit is a step-by-step guide for any-level writer covering the basic steps for writing for and profiting from regional parenting publications. This e-book fulfills a longtime dream of mine to collect all the tips and advice that I have shared in classes and dream teams over the years and offer them in a condensed, affordable e-book guide. This e-book makes a perfect companion to Writer Mama LINK and is highly recommended for those who have enjoyed taking classes with me. Written expressly for busy parents, this e-book guide is written in short, instructional chapters like a mini-workbook. Readers who follow the advice in this e-book will find themselves successfully writing and submitting articles to regional parenting publication editors in a professional manner. So what are you waiting for? Purchase your copy of Write For Regional Parenting Publications now and you will receive a link to download the PDF e-book immediately. Thanks for telling all your writer friends about Write For Regional Parenting Publications For Fun & Money! Send me your testimonial or just drop me a line at christina at christina katz dot com. 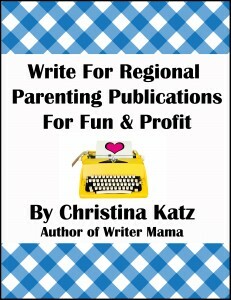 What Readers Are Saying About Write For Regional Parenting Publications For Fun & Profit! This e-book was fantastic! Christina takes you by the hand and walks you through the process of getting published in regional parenting magazines. Her strategy is both smart and fun. Thanks Christina! ~ Emily K.
Once again Christina Katz has nailed the needs of the beginner writer in a concise, encouraging manner. Even if you are already writing for RPPs this resource can be a refreshing reminder of how to serve that market successfully. ~ Sue L.
I want to write for magazines, but it has seemed so intimidating. I was just about to give up on the idea when I got this e-book. Writing for RPPs suddenly seems accessible and doable. Thank you! ~ Christen H.
After successfully writing for regional parenting magazines for several years, I still found plenty to learn from Christina Katz’s e-book. She has included everything a beginning writer would need to know to grow a professional writing career that serves the RPPs. 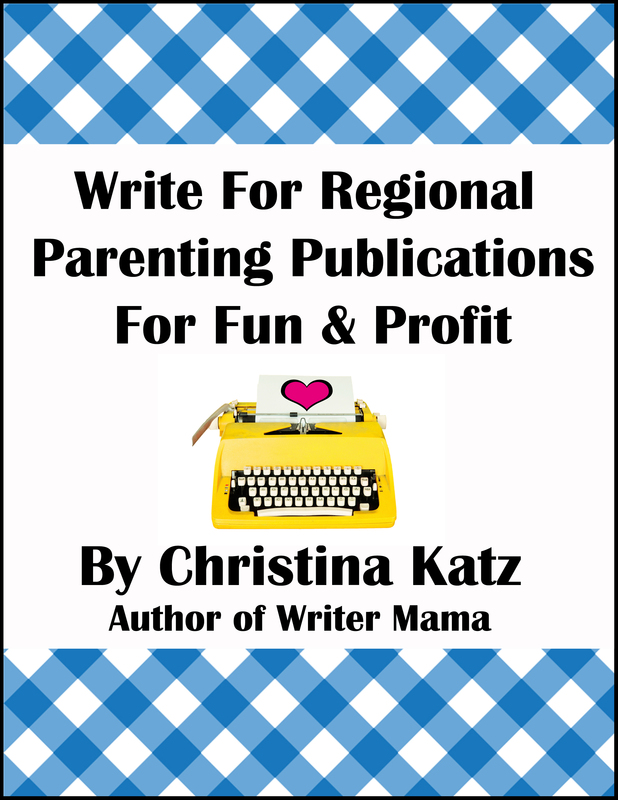 ~ Lara K.
Write for Regional Parenting Publications for Fun & Profit is a straightforward, no-nonsense guide to what it really takes to get published in regional parenting publications. ~ Alyssa C.
This book is exactly what I’ve been looking for in my efforts to launch a freelance writing career. The format is straightforward and easy to follow for the beginning freelancer and is filled with specific details that often get overlooked in how-to books for writers. ~ Yvonne S.
With idea-generating pages and valuable tips from the trenches, this guide will inspire and educate you as you go after your professional writing goals. – Christa H.
After reading this e-book, you will know exactly how to find topics and where and how to submit them. This book is a must for a beginning writer or even an experienced writer needing fresh inspiration and knowledge. ~ Ruth Ann A.
Christina Katz’s enthusiasm and encouragement are contagious. Her e-book will entice you to get started right away! ~ Kathleen M.
Even if you think you know all you need to about writing, pitching and setting up a freelance business, you should read this book. In addition to offering advice and ideas, the tone is refreshing and rejuvenating, and will help writers jumpstart their careers. ~ Beth F.
This is an excellent get-started guide for mom writers who would like to make a little extra money or to start a freelance writing business. In contrast to Writer Mama, this e-book is focused on RPPs, which is a great place to get started earning clips. ~ Tiffany D.
Christina Katz’s Write for Regional Parenting Publications for Fun and Profit was exactly what I needed when I was ready to expand my writing career. She tells you what to do and how to do it—the rest is up to you. There’s no excuses now! ~ Jane E.
Did you know my website has a shopping cart? If you put something into your cart in error, no worries. You can take your time, look around, and select items until you are ready to check out. To view or alter the contents of your shopping cart, click the button below. I am a veteran journalist, author and coach with over a decade and a half of experience and a wealth of techniques to share. I am focused on making the world a saner, more expressive place. I help folks become more creative for personal enjoyment, professional development and transformational growth. Whether you are a professional creative or hope to become one some day, I can help you embrace your personal strengths, explore your creative possibilities, and evolve incrementally into your most inspiring self. If you are ready to achieve creative consistency in your life and career, email me about monthly coaching calls. To learn more about increasing your creative confidence, please check out my online school. Stay tuned for ways to save money by becoming a Beta User for my next new course by subscribing to The Prosperous Creative. And don’t forget to get these blog posts delivered to your inbox, so you never miss a post. If you appreciate my work—school, products, blog and social media posts—you are welcome to make a contribution of any size at any time. Thank you for your support!